Fougère, originally uploaded by Christian Bachellier. It is the coumarin that adds the crystalline quality to Fougères, as well as its over all warm bitter-sweetness. Perhaps this is why I enjoy wearing Fougères at this time of year. It has the quiet melancholy of Fall, yet with a cuddly softness added to it. In 1873 English Lavender by Yardley was released, blending notes of Lavender, Bergamot, Rosemary, Eucalyptus, Geranium, Clary Sage, Cedarwood, Tonka, Moss and Musk. Considering that tonka bean contains mostly coumarin, and that all the other important elements of Fougère (lavender, oakmoss, coumarin and herbs) are present, this might have been the first Fougère . 1877 brought Wild Fern by Geo F Trumper (with notes of oakmoss, basil and amber), again with both a name and a composition that suggests a Fougère (but who had smelled it that could confirm???). Fougère, or Fern in French, is most known for its remarkable botanical versatility and resilience (as I said earlier, it has been probably been around since the days of the dinosaurs, it is such an ancient life form that it reproduces with spores and has no real leaves, but “fronds” ) and little known for its scent. However, ferns have a rich usage in human history for various uses: the dried underground stems of several species used to be ground into a starchy meal-like substance that is nourishing in times of famine (and in particular - Pteris esculenta in the Pacific Islands they have been a staple food); and the ashes of burnt fern in Wales were formed into balls and sold as “Ash Balls” and performed similarly to soap because of their high alkali levels (Poucher, W.A., “Perfumes, Cosmetics & Soaps, Vol.2). 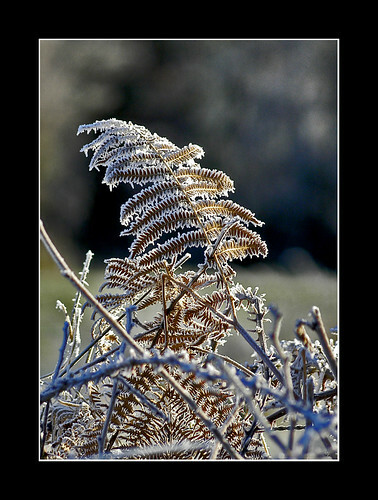 Certain ferns might be extracted for medicinal purposes (for their filmarone content – a yellow, amorphous acid which chases away worms). Natural Sources of Coumarin, originally uploaded by Ayala Moriel. In perfumery, however, any Fougère composition will have very little power for vermifuge purposes. It is simply a name for a complex blend of an aromatic, herbal nature. The key for compounding a Fougère is using the essential accord of lavender and linalol (either synthetic or from natural source – i.e. Ho Leaf or Rosewood), oakmoss absolute and coumarin (of synthetic or natural source – i.e. tonka bean or liatrix). Additional vanillic notes may increase the softness, to create a Fougère Ambery fragrance. These are soft and enveloping, and somewhat powdery. Canoe by Dana is an example of such composition, which is further sweetened by tonka and heliotropin. Additional woody notes such as sandalwood, agarwood and vetiver create a cleaner and drier impression. These Fougères are very complex, with the addition of bright florals such as neroli, lily of the valley, and cyclamen. The dryness of lavender and spicy, ambery and woody notes makes these more masculine. Jicky (Guerlain) is a good example for such floral – with neroli at the heart, and a soft tonka and amber base accompanying the Fougère accord. Many modern masculine fragrances are touted as being Fougère. Scents such as Cool Water (for men) by Davidoff are such examples, and so are many others. However, the overdose of synthetic molecules (such as calone and other aquatic aromachemicals) and the declining percentage of important natural such as lavender and oakmoss in those compositions render the Fougère in these perfumes nearly absent. A good fougere in my mind has a balance of those intense, isolated molecules with a good measures of naturals that give it its aromatic flavour. How To Make A Natural Fougère? Thank you Ayala - I love these posts on Smelly Blog, they are so informative. I knew that ferns were some of the most ancient plants - after all many say at the times of dinosaurs there were no trees and that the forests were made of giant ferns, but I was very surprised to read about fern being a source of nourishment! I was under the impression that most ferns are toxic. For the natural fougere I would add as an important ingredient geranium. All classical fougeres have their heart built around a rosy note. For the linalool and geraniol you can think also of palmarossa oil and for a "spicy" linalool coriander is very good. I've included my favourite type of geranium - Rose Geranium. It is the most rosy of all, and also herbaceous. I find the Geranium Bourbon to be overtly sweet-fruity and candy-like. I've never thought about coriander as a linalol type, but it does make sense now that you mention it. I will add it to the list! Thanks for sharing your perfume-chemistry knowledge here - it is much appreciated and most welcome. There is still so much for me to learn about that! Oh, and I forgot to mention - coriander is one of my favourite spice notes (and also a favourite spices and herbs to use in cooking and baking!). I love how mellow an exotic it is, almost more sweet than spicy. I love it with ambrette, jasmine and the citrus notes - and of course with other spices. It's soul-mate, I think, is cardamom! Ayala, why not Hay Absolute for the coumarin notes, rather than Tonka Bean? Although I did not list Hay Absolute here (no idea why - but thanks for pointing out the absence) - it certainly is a note to be used in fougere scents. As well as its cousin, Flouve. 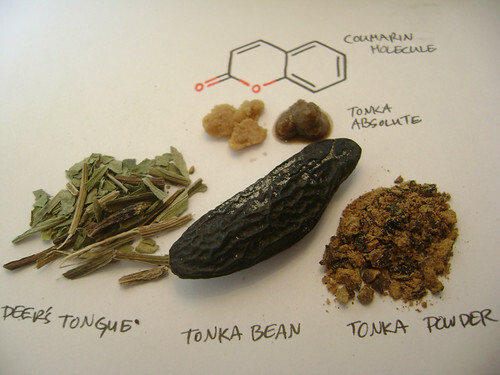 Tonka bean absolute, however, is closest to pure coumarin - there is hardly any other components in this absolute and it creates a whole other effect to use this nearly pure molecule; especially if you are restricting yourself to only naturals.